Like most of the great ideas I come up with, this was actually my wife's idea. I hope you all have a spouse or significant other that is as intelligent and caring as my wife, it makes your life better by far. Anyway, this is one of the newer additions to the site and what better than mystics. Man really hasn't changed that much in several thousand years. We all want to feel in control of our lives and deep down, we all want to know the secrets that the world has to offer. It is those secrets that make our lives interesting. Some call these secrets progress, the unlocking of technology at it rages on to give us all new toys and gizmos that geeks(like myself) and kids drool over. Most adults consider for while and eventually purchase the technology, and once adjusted we all just take for granted the ease that the new products have made in our lives. To other people the secrets are about history and the past. The pull of our past is a powerful force and scientist, historians, artists, collectors and hordes of others all find our prior history to be very exciting. Anything that sheds new light on a long forgotten era or region of the world is exhilarating in its own right. The picture of Stonehenge on your right is a prime example. Many mysteries to be unlocked there, but the precision and significance is fascinating. 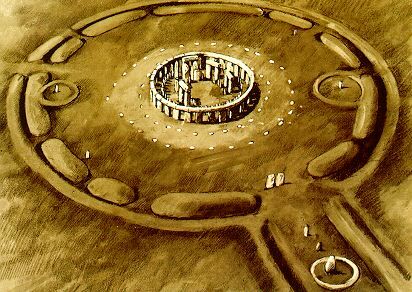 Part of this is related to Druids, which many consider in the mystical side, but really this is about history and culture not mysticism. Along the same lines as our past is exploration. The Titanic, new animal species, underwater mapping, mountain tops, Mars, all those places that hold a knowledge that know one will know about until someone arrives to take a good look around. This is all well and good. There are some secrets though that are really good and plan on staying that way. 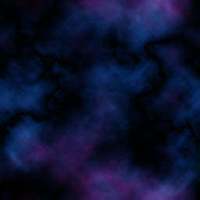 These are the ones that are hard to see, and once they are seen, are even harder to share, because not everyone believes them. Another reason that these secrets stay hidden is that even though some of them are unlocked, the knowledge is not passed on because they are afraid to let others know what they have learned. Fear of scrutiny is a great motivator for keeping information hidden. The American Heritage Dictionary describes mysticism as	"Of or having a spiritual reality or import not apparent to the intelligence or senses." Well that sounds really proper but lets break that down into layman's terms. Mysticism is the dealing with spirits or forces that you cannot see, but still affect this world. Notice I said, spirits OR forces. This is important in that the descriptions of why and how are varied. There are several animals that many consider part of mysticism, but that will not be covered on this page. Look in the Folklore or Monster pages if you are looking for creatures. So that being said, if someone was to utilize these said forces and see signs that are left by them, you could gain insight into people's lives or possibly predict the path that a person would follow based on the person that they are and the forces in influence. Wow, that was kind of mouthful, I should probably explain that a little more. Let give an example, we are going to look into the life of Bob. Bob is not an extraordinary man, but he has his moments. He is a detective, married, with a daughter and a son. He does his job well and saves lives when the times comes. Unbeknownst to him, there is an informant that leaves clues for the police department, lets call him Bill. Now Bill is subtle and many times Bob doesn't even know that there was anything out of ordinary, but being a good detective, he starts to pick up on the little tips that Bill leaves behind. Here and there, Bob will see the evidence that Bill has been around and is leaving little clues to help him out. Now there are not many people that see what Bob sees, he is really very good at what he does, and when he mentions Bill to the other detectives, they don't believe him, but to Bob, Bill is not just real, but very helpful. This is in essence the same thing that most mysticism is based on. There are signs you can watch for as well as tools and procedures to help you see those signs. Some of these signs are more direct, they almost would not be be called signs at all but visions or feelings. In this case the conduit to the information is the human mind. Portents or prophecy are good examples of this. A simpler example of seeing some of the information left for us would be palm reading. Some of the tools I was referring to, would be a Ouji board, Tarot cards, rune stones and a slew of others. Divination through physical symbology has be around for eons. I have compiled a list of difference divination techniques and a brief description. Click Here to look at the list. I briefly mentioned procedures, and this would be a ceance, ritual or spell. Most have heard of witchcraft, not to be confused with Wiccan, as well as Voodoo so I will not dig into this too much. I am not going to be putting a spell list on the site, sorry folks, but it is the idea that it represents that is important. A spell or ritual has to have power to work and part of the unknown is where that comes from, which makes it mystical. It must be said that most of this is harmless, I don't think that palm reading or tarot cards are going to injure you in anyway, but some of the topics I will cover here can be dangerous if not given the deference that it deserves. The point is that most people don't know that much about mysticism, that is what the name implies, and if you try to get into this with the thought that this is just a bunch of mumbo jumbo, you can get hurt. I personally will not touch a Ouji board anymore for this reason. Be warned, some of this is like Mother Nature if you don't respect it, it can bite you, sometimes hard. Tarot is now one of the first things that people think of when they think of mystical tools. Really, Tarot is a youngster in the mystcal world. It has only be been around since the 15th century (I say "only" loosely, 600 years is a long time to me) and started somewhere in northern Italy. At that time it was just a card game, usually called the Game of Triumphs or Trumps, and the non-suit cards were trump cards. It was all the rage with nobles and quickly spread to Sicily, France and Germany. Many decks were custom made and the artwork was varied. It was shortly after the cards became more well known that a sermon by a Franciscan friar, in approximately 1460, depicted that the Tarot decks were evil, especially because of the Devil, Death, and the Tower cards. This friar took a simple card game and told others that to play the Game of Triumphs was to lose your soul to the Devil. This was the beginning of the secrecy that would surround Tarot in the future. Tarot made a rebirth in the public eye in around the 1700's. A book was published by Jean-Baptiste Alliette (also known as "Etteilla") in 1770, and it was the first of its kind. It told of divinitory meaning in the cards. He only wrote descriptions for 32 cards however. Antoine Court de G�belin also made an impact on Tarot with his devout and vocal views that Tarot held some magical meaning related to the Egyptian god, Thoth. Both of these inspired a surge in Tarot that continued with more publications by Etteilla on the subject. Court de G�belin's theory continued and there was a resurgence again close to 1850 when the gossip flew around the nobles and hence the world that the Romany people, or Gypsy as they have come to be called, were descendants of Egypt and carried the decks on their travels through Europe. Later in the 1800's Elphis L�vi theorized a tie between the Kabbalah and Tarot. One of the key things that this theory set into motion was that he used all 78	cards, not just the trump cards. This was a major stepping stone to the Tarot that we have today and L�vi made several decks for the public in his lifetime. In more recent times, early 1900s, Arthur Edward Waite set a new precendent for Tarot. Commissioning an artist, Pamela Coleman Smith, Waite directed her in new pictures to be drawn, calling it the "rectified" Tarot. This was a major break through in that much of the symbology of the cards was portrayed in the imagery, sometimes called "pip cards". This allowed people to learn the sigficance of the cards and their meanings, thus giving them a larger appeal and simplicity in their use. This artwork is now considered the standard that most decks currently revolve around, it is called the Rider-Waite Tarot art. Most everyone that knows anything about Tarot will tell you that the cards are not the power, they are just the tools to see by. There are several formats that can be used from just one card to a complicated nine card setting, to give a reading. 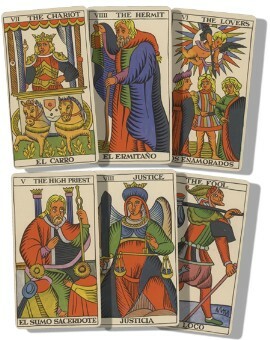 A reading is the term used to describe looking at the cards and understanding their meaning to possibly predict the future or the nature of the person. If you want to see some of the meanings click here for the tarot descriptions. It can be as simple or as complicated as you want it to be, which is common of many mystical topics. The essence of the Tarot is pretty much the same. It can see your past, present and future situations and give you some insight on how to progress from this point to either fulfill on the future that it sees, or to find a way to change a future you wish to prevent. If you need	know more, look up your local mystic store for Tarot books (try next-mill.com), or go to Tarot.com or Aeclectic.net for a ton of decks. Elijah J Bond patented his version in 1891, and the very next year William Fuld bought the rights from him. In 1966 Parker Brothers bought the rights and moved the manufacturing to Salem, Massachusetts. The first year the board came from the Salem plant was a record breaking year, with over 2 million boards made which actually out sold Monopoly. Really the Ouija (pronouned Wee-ja) has been around much longer. The Romans used a type, the board almost looked like a map at times, back in the 4th century. It was also said the Greeks used them as well even prior to that. 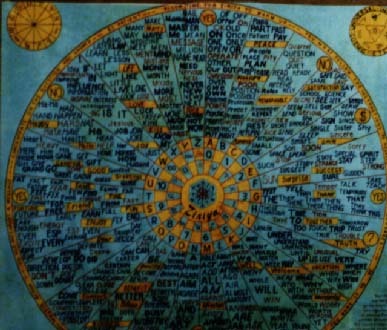 The more current versions, since Bond redid the board in the 1890's, has a common layout. There are Yes and No on the top, I have typically seen Yes on the leftright. The alphabet is split in half and displayed with a curve in the center. Numbers one through zero are usually just below the letters and below that is a version of good-bye, I have seen it in several languages. There may be some other symbols on the board somewhere, but that layout is now fairly universal, I have an example on the lower left. Also included is a slideable 3 legged device, called a planchette. This is usually made of plastic now with a clear window toward the top-center. Many old ones were made of wood. 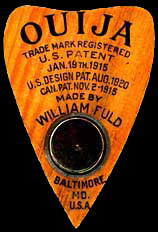 I have a picture of one of William Fuld's planchette from the early 1900's. 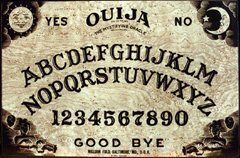 The idea behind the Ouija board is mainally about the ideomotor effect. This is similar in concept to a dowsing rod. This idea started in 1852 by William B. Carpenter, he was the orginator of the term "ideomotor action". This theory by Carpenter suggests that muscular movement can be initiated by the subconscious mind, independent of emotions, logical decisions, and volition. If asked a question, the subconscious mind would answer truthfully to the knowledge of the person, as in theory the subconscious would not lie. Further on this, the subconscious mind is subject to influence from outside sources that we may not be aware of, namely spirits or paranormal entities. 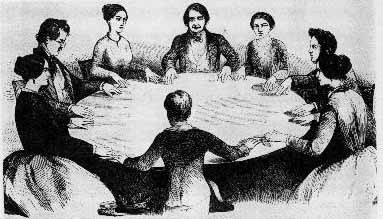 This is the originator of the seances with a Ouija board attempting to get answers from a lost spirit, using the user of the board as a conduit to communicate. There is a connection to potential here, by this I mean not everyone can use a Ouija board. Letting go of yourself enough to tap into your subconscious sounds easy in words, but can prove difficult in practice. Those individuals that are easy to hypnotize seem to be those that also find letting down the barriers a little easier. Dealing with your subconscious is not to be taken lightly. I can not emphasize this enough, PLAYING AROUND WITH THIS WITHOUT THE PROPER RESPECT CAN BE DANGEROUS. A lot of this can be said is a lot of bullcrap, it all really boils down to belief structure. Fine, not everyone believes in spirits. We can all deal with that, but just for the sake of arguement, bare with me on the premise that it could be true. Let take Joe(fictional character), as an individual he is easy to hypnotize. He knows this, he has fallen victim to it at some comedy show and was made to look the fool. The comedian could tell him to do whatever he wanted and he would do it because his subconscious mind told him to. Now Joe is now enthralled with the supernatural, hears about a Ouija board and decides to try it out. Now under the premise that spirits exist, any spirit with considerable amount of willpower would be able to influence Joe while he is in his "meditative state" while using the board. This may be just to say "Hello, my name is Bob." The crowd at the seance goes wild. On the opposite side of the coin, if the spirit with the willpower is malignent, Joe could be in trouble. He could tell him to do horrible things or put him in coma, use your imagination. In a more realistic version of this story, while Joe is under, one of his friends decides to mess with his head, not knowing what he is doing and puts a thought in his subconscious that could ruin his life, and has no idea how to fix it. This is not to say that the board cannot be used. 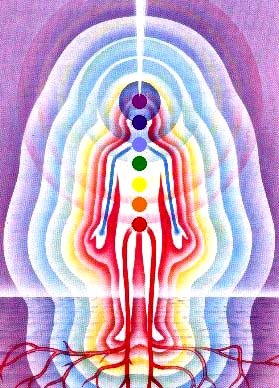 Many people use it to find the true answers inside themselves. Tapping into your subconscious takes practice and patience and can be a usefull and rewarding tool in your life. However, I say again, treat this concept with respect. Just because you don't know, doesn't mean that things can't hurt you. More of an searching skill, this is one of the oldest types of divination. It has been mentioned as far back as 5000 B.C. and possibly earlier. 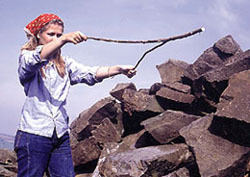 The dowser, term for the individual using the tool, will use a dowsing rod(s). In older times they used a forked piece of wood or two sticks crossed. Now you can find all different kinds, but really the material is not important. The dowser will hold the rod(s) and walk across the area and when the tip dips or cross, it marks the spot of what the dowser is looking for. This can be widely varied, water seems to be common, but minerals such as gold or coal, oil (dowsing rod is called a doodlebug if searching for oil), even people or something as mundane as keys can be searched for. Another form of dowsing that doesn't use a rod is pendulum dowsing. This would obviously require a pendulum, a usually with pointed tip, and can be used with a map. In rare instances the pendulum is taken in the field, but again this is rare. Mostly the pendulum is swung lightly over a map, once the dowser feels a pull in a certain area they can zero in on a location. This method is used to search for the same items that a dowsing rod would be used for, but this helps so that they wouldn't have to walk for hundreds of miles. There is much skeptism over this in the scientific community, as there always is with supernatural or mystical divination. Several studies have been done in Germany testing the validity of dowsing and most scientist will say that this is just a bunch of people that have fallen to the post hoc fallacy. Post hoc is defined as people believe that Event A happened because of Event B, when they may or not be related. In the case of dowsing it would be that the dowser found water, but anyone could have picked that spot randomly and found water, but the dowser said it was because of his abilities. Needless to say, the believers keep calling the dowsers, and the scientists say bah-humbug. Nothing new about that concept. Most have heard about this is some fashion, although most would say that it should not belong in this section. This goes back to my introduction where we talked about forces that cannot be seen as part of the description of mystical. That definitely belongs in this section. ESP stands for Extra Sensory Perception. This term can be used to describe a lot of phenomenon, some of which is covered in various areas of this site. First is the perception of spirits. I have a whole section on spirits and ghosts, but I will describe this in a little more detail here. In the scientific world, just to be able to see or hear spirits is a form of ESP. There are spirits strong enough that they can affect the physical world, and of course everyone can see or hear this. I am not referring to these, I am talking about those people that can see what others cannot. Many are called mediums. Another form is divination or predictions. It has been recorded that there are some that can see into the future for brief periods or see what is happening at the present, without having to be at the location in question. That sounds complicated, but it really isn't. An example would be a mother that is upset because she is under the belief that one of her children is hurt, and come to find out her son broke his leg at the park and is on his way the hospital. On this same idea, a man insists that his friend should not go out on a date, and then finds out later that night that the friend's potential date got in a car wreck and was killed. Everyone has heard stories like these at some point, or has seen a show where this has been portrayed. These would all be a form of ESP. The other term that is used would be psychic abilities. ESP could be termed a type of psychic ability, but what most attribute to abilities is to be able to affect something with one's mind. The most common terms are psychokinetic, telepathy, pyrokinetic, and chyrokinetic. These are respectively, the ability to manipulate objects, others minds, and the last two, temperature, hot and cold. Manipulation of certain forces fall under the pschokinetics category, but with specifics. Kinetic energy is the movement of all molecules in the physical world. This could be reshaping or moving objects, modifying fields such as magnetics or gravity, or manipulating electricity. 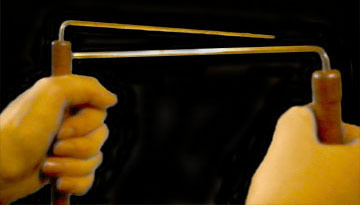 In the technical sense, pyrokinetics and chrokentics would be a subset of pschokinetics, since the increased movement of molecules within an objects is what determines temperature, however since these powers don't really change the basic shape of the object, at least directly, it is considered separate. These seem like fantastic powers, something more out a comic book like X-men than real life. However, these abilities including ESP, have been talked about for centuries, even millennia or longer and X-men has only been around since 1964. Are they real? Do people really have these kinds of abilities. I can imagine if we do, in this day and age, it will by and large be kept a secret. No one wants to let others know about special gifts (or curse depending on perspective). This could possibly mean being outcast by friends and family, tested by the government, or worse. In a time when these talents were more commonly accepted, there were seers, shaman, medicine men, wise men, prophets or sibyls, oracles, witch doctors, the list goes on and on. This is not gender biased either, although most of the names I provided seem that way, there are just as many women with these abilities as men. These abilities however were just part of everyday life. Science has attempted to disprove these abilities, making the populace hide them. Maybe someday it will all come out in the open, in the meantime it will mostly stay conjecture and fantasy to most people. Maybe that is the way those few would like it to stay. The main theme that ties all of these concepts together is that no one knows the power behind what makes this all work. Is it divine, spiritual, or purely biological? Possibly this is government testing in the works? Is it fate or destiny and if it is, what power is it that preordains us to the life we will live? God, more that one god, goddesses? Is man the only influence	or do others have an impact, animals, plants, a Mother Nature or Earth spiritual entity, and for the the conspiracy theorists out there, aliens. It could be none or all. As the old adage says, the more we know, the more we know what we don't know. People love drama, and mysticism can provide this in vast abundance. As long as there are dark corners and questions unanswered, mysticism will continue to be in the lives of man. There are many more areas to cover under mystics, but I haven't had a chance to write them. Please check out the rest of the site and let me know if you have questions or ideas.